A truly unique white wine. Traditionally grown throughout much of southern Spain, this variety thrives on heat and dryness. We are one of the few producers of this wine outside of Spain. Grown in Santa Barbara County. Winemaker: J.P. Pawloski of River Run Vintners. Our 100% Pedro is back! As winemaker Colin McNany says: “The only thing added is love. It was fermented on its native yeast, no acidic addition, just truly dry-farmed Pedro.” This crisp, acidic white wine has body, minerality and a pear/citrus finish. On warm summer evenings enjoy with cheeses, fish, salads and paella! We searched for a long time to find a quality white wine grape that would flourish in the hot climate, dry-farm management, and head-trainedstyle of our organically grown vineyard. This unique Pedro Ximénez varietal grows under similar conditions in southern Andalusia, Spain and has exceeded our expectations. With the 5th year of drought, our yield was very low. We found Riesling grapes from Wirz Vineyard in Cienega Valley grown in the same dry farmed, head-trained style as ours. 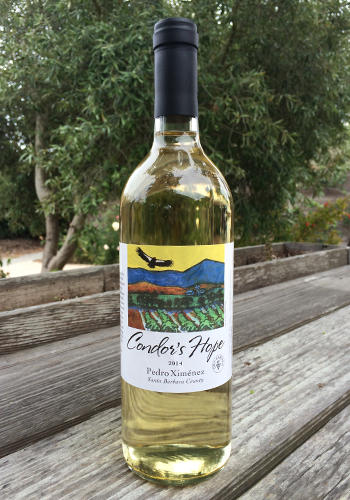 Our winemaker, JP Pawloski artfully blended these sister varietals into a dry wine that will delight you with the taste of citrus and a finish of ripe pears. Enjoy this unique blend with tapas or grilled fish on a warm evening under the stars. Released June 2017. Only 40 cases produced. Grown extensively in southern Spain, this variety thrives on heat and drought, unusual for a white grape. This white wine is unique: rich and viscous, with hints of pear and fresh citrus coupled with an earthiness that reflects our dry-farm system. Its minerality lingers in your mouth refreshing all of your taste buds. To be released July 2016. This white wine is unique: rich, viscous, with hints of pear and fresh citrus coupled with an earthiness that reflects our dry-farming system. Pair with everything from salads and cheeses to burgers and light desserts. 31 cases produced.